Ready for the perfect treat? This Chocolate Mug Cake is so quick and easy to make, you’ll be munching on Chocolatey Peanut Butter goodness in less that 5 minutes! Serious – it takes just 1 minute to cook in the microwave! And the awesome thing about mug cake? You cook it right in the mug! So no worries about eating the whole cake because you’re only cooking a single serving at a time! So when you’re ready to indulge a little, get that chocolate fix taken care of, go ahead and whip up one of these bad boys. In your favorite coffee mug, add 2 tablespoons of flour. I use King Arthur’s Bread Flour but I’m sure any AP flour will work fine too, including whole wheat. Add 2 teaspoons of sugar (or to taste), 2 teaspoons of unsweetened Cocoa Powder, 1/4 tsp of Baking Powder, and a pinch of salt. Whisk all these dry ingredients together until it’s uniform in color and mixed well with no lumps. To the dry ingredients, add 2 Tablespoons of unsweetened Almond Milk and 1 Tablespoon of unsweetened Applesauce. Mix that together until you have a smooth batter. Be sure and scrape around the sides to find any pockets of dry flour. At this point you can mix in a small handful of chocolate chips if you want, but this is completely optional. Remember, most chocolate chips sold in stores are full of fat, sugar, and dairy products. It turns out that all the bad things commonly attributed to non-raw chocolate bars, such as weight gain and diabetes, are actually caused by the dairy, sugar and others fillers added to the dark chocolate – so look for raw cocoa in its purest form like these Cocoa Nibs. We serve a few chocolate desserts (made with cocoa powder and sugar) at the McDougall Program and many such desserts on our adventure trips to Costa Rica. We use a product called Wonderslim Wondercocoa (100% pure cocoa powder, fat-free and 99.7% caffeine-free) for our chocolate brownies and puddings. Why do we serve desserts with chocolate? Because people love them. The McDougall Diet is not prison food. For most people, a little chocolate is not going to adversely affect their health. I put this food in the same category as other rich plant foods like nuts, seed, olives, and avocados. Trim healthy people can use these rich ingredients in small amounts. Now, take 1 Tablespoon of peanut butter and kind of bury that deep down in the batter. Don’t mix it in, just kind of leave a lump of peanut butter right in the middle and cover it in batter. Pop this in the microwave for 1 minute and you have the tastiest, instant chocolate mug cake you’ve ever had. A rich decadent Chocolate Mug Cake ready in 1 minute. For those special occasions when you just gotta get your chocolate fix. Cooks right in the mug! Thank you for this recipe. Can’t wait to try it. I wonder if PB2 would work in replacing the peanut butter in this recipe? I made this using the PB 2 and it worked just fine.Just made this mug cake and it was delicious !! Does this version Rise or does it come out flat and dense. I have experimented with oil free mug cakes but have so far never been able to get a light cake that rises properly and holds his shape and doesn’t fall back to a chocolate pancake once it cools . I hope the end result of this recipe is a light cake that holds its’ shape. Thanks for posting. Well, this is a treat. The peanut butter addition did the trick for making this really delicious. 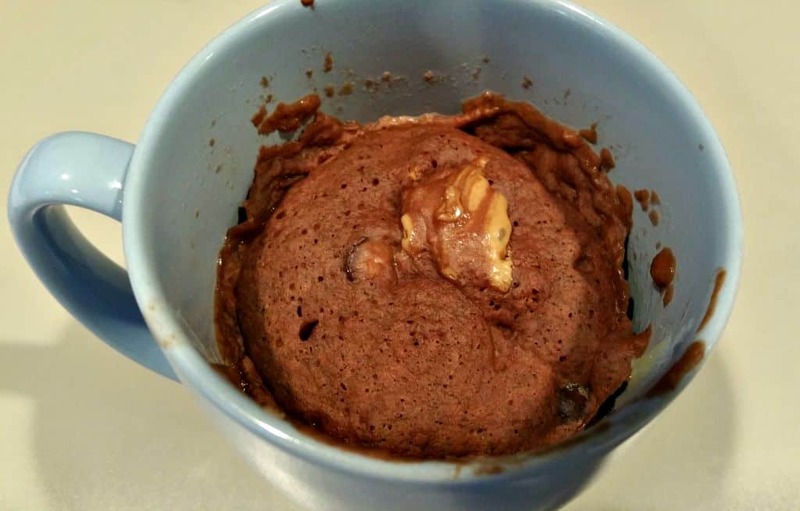 I’ve made other fat free, dairy free mug cake recipes and have been unsatisfied with the spongy texture but I was only satisfied with your version and I think the peanut butter was the trick. Thank you, Chuck. I needed something a little sweet tonight so I tried the mug cake. All I have is whole wheat pastry flour so that’s what I used. I think the mug I chose was a little too large so the batter made a layer only an inch thick. My cake didn’t rise very much but it tasted great. The addition of the peanut butter makes for a richer and creamier mouth feel. I’ll definitely make this again when I need a little chocolate treat. If it had made more than one serving, I’d have kept on eating so this was smart, forced portion control. Thanks for the recipe. I am going through some stress right now (Translate: GIVE ME CHOCOLATE!). I divided this into 2 silicone cupcake cups. 1 for me and 1 for hubby. Just enough to satisfy the chocolate craving, but not too much to go overboard. Fluffy and delicious. I skipped the peanut butter and put chocolate chips on top.